Recently I had the privilege of visiting with missionaries in the Tri-County area of Knox/.Laurel/Whitley that minister to children and youth. My first visit was with Missionaries James McDonald, Lorie Wells, Beth Arnold, and other volunteers with BREAK (Bible Release-time Education Association of Kentucky). I had heard about this ministry but actually got to visit and participate in a couple of classes a few weeks ago. 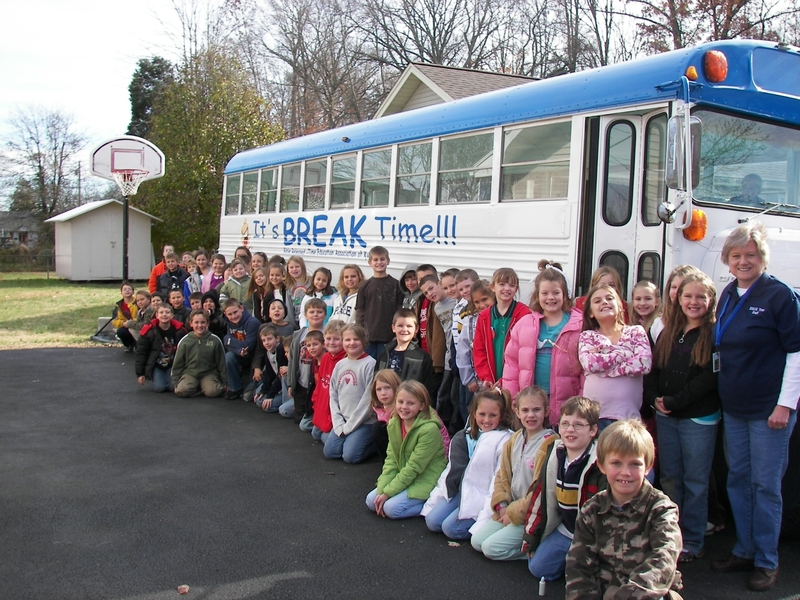 BREAK is a non-denominational, non-profit, Christian organization that provides Bible based moral instruction to public school students during the school day. Students are released from school with the permission of their parents to attend Bible study off public school grounds. In Corbin the leaders of BREAK have converted a blue and white bus into a classroom where the students meet. Public schools do not support or oppose BREAK. There was so much excitement in the children as they climbed on the bus for BREAK. They joyfully sang about God, interacted with the Bible lesson, and located verses in their Bibles during the Bible drill time. It was so touching to hear the students request prayer for their families and friends and then to hear their sincere hearts as they prayed for these needs. Another missionary I met with last week is Tim Bargo. Tim ministers to youth in grades 6 – 12 through First Priority Tri-County. First Priority clubs meet at the school campus in the mornings for 15 – 20 minutes before classes begin. Currently they are in 30 schools in the area. Priority clubs are student led, with a faculty sponsor who volunteers his/her time. Several of the clubs have a campus coach, such as a youth pastor, who also assists. So far, during the 2012-2013 school year they have reported 232 salvation decisions. There were 300 reported during the previous year. Tim also serves as chaplain of the University of the Cumberlands football team where 5 salvation decisions have been made this year. A comment was made that the greatest mission field in the United States is our nation’s public schools and the Tri-County area of Knox/Laurel/Whitley is doing a good job at reaching their students for Christ. Thank God for folk that James, Lorie, Beth, Tim, and others who care for students enough to give their time to share the Gospel message from the local middle school all the way through college. May we see more men and women step up to reach their local students for Christ.